When college professor Peter Mellor dies in an automobile accident during a zombie outbreak, he is reborn as a member of the living dead—and quickly learns that being a zombie isn't all fun and brains. When rural Ohio college professor Peter Mellor dies in an automobile accident during a zombie outbreak, he is reborn as a highly intelligent (yet somewhat amnesiac) member of the living dead. With society decomposing before his eyes and violence escalating into daily life, Peter quickly learns that being a zombie isn't all fun and brains. Humans—generally unsympathetic to his new proclivities—try to kill him at nearly every opportunity. His old friends are loath to associate with him. And he finds himself inconveniently addicted to the gooey stuff inside of people's heads. As if all this weren't bad enough, Peter soon learns that his automobile accident was no accident at all. Faced with the harrowing mystery of his death, Peter resolves to use his strange zombie "afterlife" to solve his own murder. Skillfully combining horror, humor, and film noir, Zombie, Ohio makes for an enthralling and innovative tale that any fan of the current zombie craze is sure to relish. 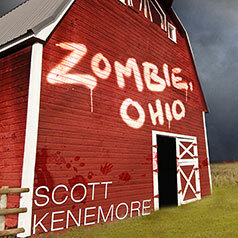 Followers of detective fiction and horror fiction alike will find something to love about Zombie, Ohio—a tale of murder, mystery, and the walking dead.